HD suggests replacing the Harley Davidson spark plugs on your M8 every two years or thirty thousand miles. Whichever scenario comes up first. The M8 has two Harley Davidson spark plugs per cylinder. Four spark plugs total. The two spark plugs on the left side of the motorcycle are easily accessible. They are basically in the same position that they have always been. However, to access the two spark plugs on the right side of the motorcycle, you will have to completely remove the fuel tank from the motorcycle. Unfortunate that we now have to handle this painted component only to change two spark plugs. 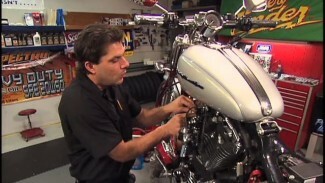 However, removing and reinstalling the Harley Davidson fuel tank is very easy to do. Try not to be in a rush when handling it and make sure that you have a clean, safe, area prepared to put the fuel tank while you continue to work. Be careful when removing the Harley Davidson spark plug wires from the spark plugs.Try to pull up on the wire and the boot (end) straight and with equal force. The two right side spark plug wires require that you use a spark plug wire pliers to safely remove. Both right side spark plugs are somewhat deep in the center of the rocker boxes. It is extremely important that no debris falls into the spark plug hole in the head(s). Before attempting to remove any of the spark plugs, be sure to blow off the immediate area with compressed air. Remove the spark plugs with a quality spark plug socket. 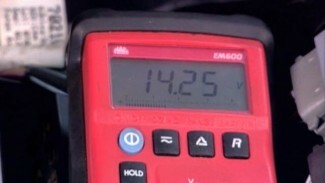 Never take for granted that the new spark plugs will be correctly gapped. Correct spark plug gap is extremely important. The correct gap for your M8 is .031″ to .035″. Apply a small amount of anti-seize to the threads of the spark plug before installation. ALWAYS start threading the spark plug in by hand. If you feel any excessive resistance or something just does not feel right; STOP immediately. Assess the situation before resuming installation. Use a torque wrench and tighten the new spark plugs 84 to 133 inch pounds. Apply dielectric grease into the opening of the spark plug boot and secure the plug wire onto the spark plug. Many will say that replacing spark plugs is easy; and it is, but it is important that it is completed correctly every time. Remember: it’s not, practice makes perfect. Perfect practice makes perfect.